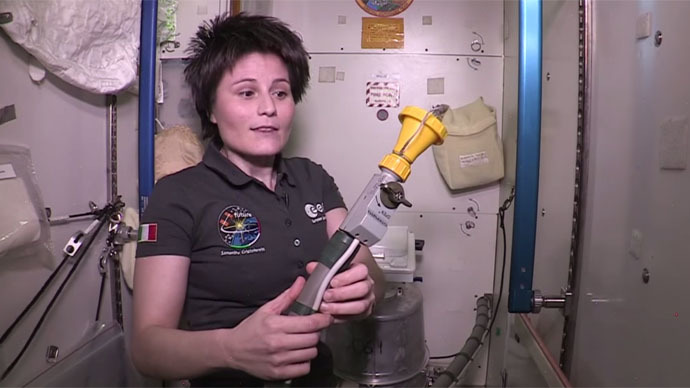 Italian astronaut Samantha Cristoforetti sheds some light on one of the more mysterious aspects of space travel: How do astronauts answer the call of nature aboard the International Space Station in zero-gravity conditions? Inside the ISS toilet cabin, Cristoforetti explains the two-step process for going to the bathroom. Taking a pee demands the use of a rubber hose, which contains a switch that activates a suction to collect the urine. Such a device is essential aboard the ISS, where anything and everything floats in weightless conditions. The liquid waste is then delivered to what is called the urine processing assembly (UPA), which is situated in the floor of the bathroom. Cristoforetti explains this is the first step in recycling the urine, which is eventually turned into potable water. The process for taking a dump works on essentially the same principle, except that the user must balance himself or herself somewhat precariously over the receptacle, which is much smaller in size than the average toilet down on earth. Here, a suction device is also used to collect and store the waste. Cristoforetti explained that the storage tank is changed once every 10 days for a crew of three.